Widget controls Z-Wave home automation network & saves electricity. Is there a better alternative to TrickleStar Widget? Is TrickleStar Widget really the best app in Network category? Will TrickleStar Widget work good on macOS 10.13.4? TrickleStar Widget is a Dashboard widget that connects to the TrickStar hardware. This hardware makes it so all of the peripherals connected to your Mac (speakers, printer, etc..) don't continue taking up costly electricity when your Mac is in sleep mode. It plugs into your Mac's USB port and automatically recognizes and powers off the utilities. TrickleStar Widget needs a review. Be the first to review this app and get the discussion started! TrickleStar Widget needs a rating. Be the first to rate this app and get the discussion started! It also can be used to manage your home automation Z-Wave network. 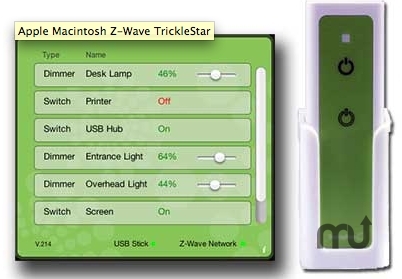 The Z-Wave-enabled remote control from TrickleStar can be used for all Z-Wave compatible devices such as dimmers, switches, roller blinds etc. It has a setting and operation mode and is fitted with two simple on/off and up/down buttons to select functions.